Volatility represents risk through the price change. The percent volatility money management method determines position size based on the initial risk defined through market volatility. The position size is increased when volatility is lower, and decreased when volatility is higher. The percent volatility PosSizer uses average true range (ATR) to define market volatility the following way: the N-day average true range (ATR) is multiplied by the security's point value (e.g. $1.00 per share for stocks when margin is not being used). You have the option to define the percent volatility and the ATR period, as well as to cap the resulting position to some percentage of account equity - so that the position wouldn't be too large. Finally, an option to round lots to nearest 100 is provided (note: lots are always rounded down but never up). 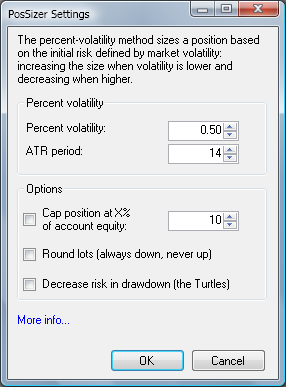 Tip: it's possible to employ the position sizing rules of the original Turtles, if you enable the "Decrease risk in drawdown" option. It's well known that Turtles were using volatility-based money management, and one important element of their rules tested for equity drawdowns and changes the size base on it. The Turtles were instructed to decrease the size of their accounts by 20% each time the original account went down 10% - and this PosSizer option does just that. It goes even further by shutting down trading once drawdown exceeds -50% of equity. The percent-volatility technique is a robust method to improve reward/risk ratios - especially suitable for trend-following systems.